CTS has designed and engineered a wide range of efficient heatsinks for electronic device, circuit, and system thermal management applications. These heatsinks are available in a variety of formats, including extruded, precision forged, and stamped units. Heatsinks can be supplied in standard horizontal or vertical mounting to circuit boards or other heat sources with a choice of round pin fins or elliptical fins for effective heat dispersion, and in compact clip mounted BGA formats to “beat the heat” while maintaining small design dimensions. 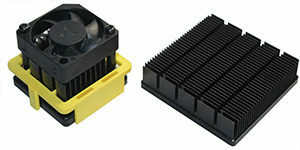 Heatsinks can also be supplied as RoHS-compliant units in a variety of sizes and configurations.